Modern pumping challenges include pumping fluids mixed with various solids or debris. Chopper pumps excel at pumping fluids that contain unpredictable solids that cause pump blockage in traditional nonclog pumps. Pumping coke slurry at a steel mill (with random rags or the occasional glove), food wastes, plastics or raw sewage in a lift station (with the presence of wipes and various plastics) are a few examples and may all require the use of a chopper pump. Understanding the pumped media helps when choosing the correct size chopper pump to ensure solids can reliably enter the pump. Also, consider choosing a chopper pump supplier with a history of success with a particular type of pumped media. Lead oxide slurry with chunks of plastic in a battery plant may have a specific gravity (SG) of 2.0 to 2.5, while raw sewage from a municipal lift station may have an SG of essentially 1.0. Pump power needed is directly proportional to fluid SG; an SG of 2.0 means a motor twice as large is needed compared to one with an SG of 1.0. Having a good estimate of head loss when pumping a specific slurry through a particular size pipeline over some distance at a particular flow can make the difference between success and failure. Head loss can generally be reduced by using larger piping and fittings to reduce velocity, but at increased cost. High percent solids slurries may have higher head loss compared to water, so having realistic estimates of head loss prior to installation matters greatly. Pumping coal slurry at 30 to 40 percent solids concentration may be possible, but pumping a fibrous slurry such as manure at 8 to 10 percent solids is often the upper limit. A fair amount of water is needed to suspend and transport solids. The slurry must be a liquid that flows. Head loss for pumping slurries can be two to 10 times higher than pumping clean water, so solicit advice from a chopper pump supplier. 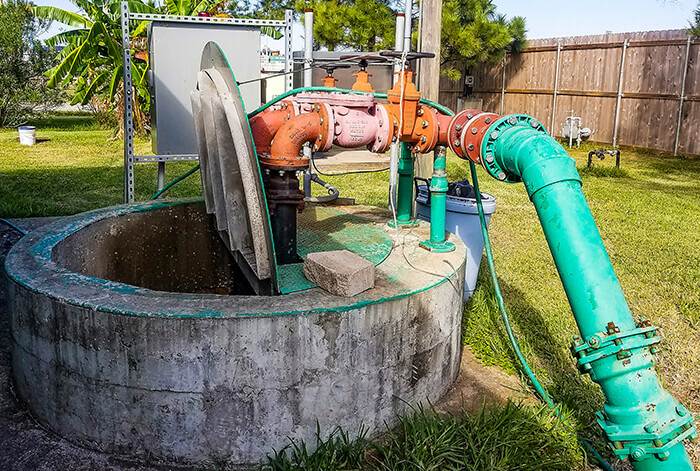 Choosing the proper flow rate can ultimately help avoid contamination of local waterways or plant flooding, save on electrical costs and incorporate reliability into the equipment design. While choosing the correct pump to resolve a solids handling problem is a good start, the system needs to be optimized to reliably handle solids. To do this, be sure the head or flow characteristics of the pump are properly matched to the system so that both operate reliably. Reliable solids pumping should be accomplished at turbulent velocities. This approach keeps solids stirred up as they move through the pipeline to avoid settling and blockage issues. Typically, turbulent flow is assured at 3 to 5 feet per second (ft/sec). This velocity is a good guideline for pumping through horizontal piping and fittings. When pumping through vertical sections of piping, 8 to 10 ft/sec is recommended to avoid settling of heavier materials (sand or grit) in the lower elbow of a vertical run of piping. Settling of heavier materials over time can cause pipeline blockage in some slurries. Velocities in excess of 8 to 10 ft/sec may result in high flow noise and wear. As a general rule, suction piping should be equal to, or one size larger than, that used at the suction entrance to the pump. For example, if an 8-inch discharge horizontal pump has a 10-inch suction flange, it is recommended that at least 10-inch piping be used, and in many cases, 12-inch piping will be needed to achieve the recommended 3 to 5 ft/sec of velocity in the suction piping. To reduce piping down to match the pump suction flange size, an eccentric reducer is recommended. The eccentric reducer should be oriented so that the flat side of the reducer is on the top side of the piping. This would ensure that air or other gases are not trapped in this fitting. Do not make suction changes greater than 4 inches in pipe size with only one reducer. This rapid change in size can cause nonuniform flow to enter the pump and cause rapid wear and vibration. Avoid the use of tees near the pump on the suction side piping. Tees induce swirling flow in the piping downstream of the tee, causing re-weaving of hair and fiber into rags, which can then plug pumps. Plugging on re-woven rags is less of a problem with chopper pumps, but the swirling flow also hurts pump performance. Y-type fittings provide considerably better flow. For lowest noise and vibration in the pump and longest parts life, provide uniform, straight-line flow to the pump and make sure all leaks are sealed. Air leaks in the suction piping of self-priming pumps make them noisy and could prevent them from priming. Keep suction piping as short and as straight as possible using large piping to minimize friction losses and to maximize suction pressure available to the pump. Air pockets just prior to the entrance to the pump must be avoided. Suction piping should be designed with no high points that can trap air or gas.